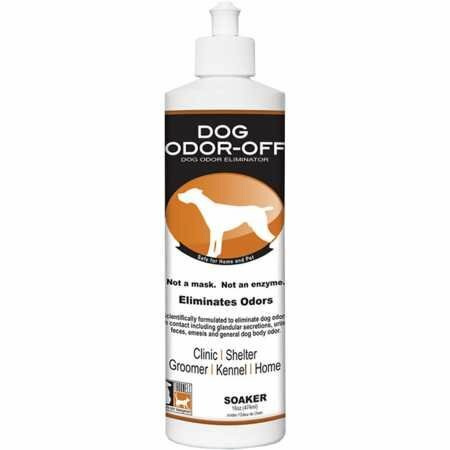 Dog OdorOff Soaker eliminates odors such as normal body odors, urine, feces, emesis, and necrotic tissue from your dog. This nontoxic and biodegradable solution is safe for both you and your dog. To use, pull up the applicator cap and squeeze the solution onto the problem area of your dog. This may also be used on cages, bedding, fabrics, and any other place that may have an odor problem. Once dried and properly reached, the unwanted odors will be completely gone Scientifically formulated to eliminate any dog odors on contact. For use anywhere, anytime. Safe for home and pet. Not a mask, not an enzyme. Nontoxic, nonirritating, nonflammable, noncarcinogenic, biodegradable. Fleas and ticks hate its natural cedar fragrance. If you have any questions about this product by Thornell, contact us by completing and submitting the form below. If you are looking for a specif part number, please include it with your message.